Department of Pharmacology 1, Rajendra Institute of Medical Sciences, Ranchi - 834009, Jharkhand, India. Department of Computer Science Engineering 2, Kalinga Institute of Industrial Technology (KIIT) University, Bhubaneshwar - 751024, Odisha, India. ABSTRACT: Over the counter (OTC) drugs are drugs easily available without the prescription of a registered medical practitioner (RMP) and self-mediation practices of these drugs are very common in medical students especially in diarrhea which mostly requires dehydration therapy only. But very few reports are available regarding the use of OTC antidiarrhoeal drugs. The aim of the study was designed to assess the practice of self-medication for diarrhea among second year medical students in RIMS, Ranchi, Jharkhand. This was a cross sectional study conducted among medical students in March-April 2017. Data was collected through self-administered questionnaire and result was expressed as percentage frequency. Questionnaires were filled completely by 224 students out of 269. 81.48% males and 85.07% females were practicing self-medication. Books were the major source of information about drugs and mild nature of illness was the main cause of self-medication practice. The most common drug group used for diarrhea was oral rehydration salt (ORS) and about 41.07% have used self-medication once in past 6 months. In 75% cases diarrhea was food associated. 41% of the students were against the practice of self-medication. Our study showed that self-medication is widely practiced among medical students and mild nature of illness was the main cause. Educating these medical students regarding the advantages and disadvantages of self-medication is necessary to create awareness among them. INTRODUCTION: Over the counter (OTC) drugs are medicines sold directly to a consumer without a prescription by a health care professional as compared to prescription drugs which should be sold to consumers possessing a valid prescription. The use of OTC drugs has steadily increased in the global and Indian pharmaceutical market. The availability of OTC medications makes it possible for consumers to treat numerous ailments without the supervision of health care professionals. While OTC drugs have their own benefits such as self-medication, they also bring with it several disadvantages such as misdiagnosis, overdose and drug interactions 1. Self-medication is a prominent feature of health care today. It may be defined as the management of a minor ailment using a pharmaceutical product that is available without a prescription 2. It is selection and use of medicines by individuals to treat self-recognized or self-diagnosed condition or symptom 3. Self-medication also involves getting medicines without a prescription, resubmitting old prescription to buy medicines, telling about medicines to friends or relatives or using left over medicines started at home 4. It is the use of any medicine for self-treatment of any health problem without consultation of a certified physician. It is a widely prevailing practice especially more common among health care students. It can give grave consequences because it may influence their professional decisions 5. Self-medication is common among practicing physicians also. The self-medication practice among doctors develops during their undergraduate training 6. Acute diarrhea in adults is a common problem encountered by family physicians. Diarrheal illness accounts for 2.5 million deaths per year worldwide. In the developing world, infectious causes of acute diarrhea are largely related to contaminated food and water supplies. The most common etiology is viral gastroenteritis which is a self-limited disease. Most patients do not require laboratory workup and routine stool cultures are not recommended. Treatment focuses on preventing and treating dehydration. Oral rehydration therapy with early feeding is the preferred treatment for dehydration 7. So self-medication is very common practice in acute diarrhea especially by medical students. There are several reports addressing the extent of self-medication practices among university students in Indians states 8, 9, 10, 11, 12 as well as in other countries 13, 14, 15, 16. Medical students are more inclined to use antibiotics and medications for diarrhea and constipation as compared to non-medical students while non-medical students use more sedatives 17. In rural area of Uttar Pradesh also, after paracetamol next common drug group used as self-medication is gastrointestinal drugs 18. But there is lacking of data about self-medication with OTC anti diarrheal drugs among Rajendra Institute of Medical Science (RIMS), Ranchi students. So the current study was undertaken to describe the practice of OTC antidiarrhoeal drugs used as self-medication among 2nd year MBBS students of RIMS Ranchi. METHOD: This study was a questionnaire based cross sectional study conducted among the second professional medical students of RIMS, Ranchi, Jharkhand, India. This study was conducted in Department of Pharmacology between March to April, 2017. Students, who participated in the study were explained about the aim of the study. They were ensured about confidentiality of the information collected. A self-prepared questionnaire regarding the practice of antidiarrhoeal OTC drugs was given to them. The questionnaire had questions related to knowledge about OTC drugs, sources of drug information, name of OTC antidiarrhoeal used, frequency of intake in past 6 months, specific cause of diarrhea, reason for self-medication and lastly idea about practice of self-medication. Questionnaire was given to them during one of their lecture classes of pharmacology and were asked to return after filling it completely. All questions were multiple choice questions and they have to tick only one correct answer. Filled questionnaires were evaluated for their completeness and only the data from the completely filled questionnaire was taken for analysis. Data was analyzed in the form of percentage. RESULTS: Total 269 students participated in the study. The data of 224 students were filled consistently and completely. Thus the data of 224 students were eligible for analysis. Table 1 shows that total 269 students participated in the study. Half students 135 (50%) were males. Total number of students indulging in self medication were 224 among which 110 (81.48%) were male and 114 (85.07%) were females. 156 (70%) students were within age group 21-25 years while 65 (29%) were below 21 years and only 3 students were above 25 years. The most common source of information about drugs for medical students was books (41.07%, 92) followed by advice from seniors/parents (20.32%, 50) as shown in Fig. 1. 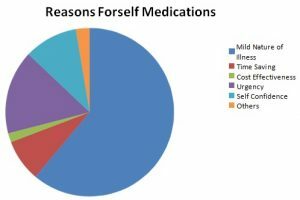 Majority of medical students 61.16% used self medication because they thought that illness was mild in nature while 16% have used self medication due to urgency as shown in Fig. 2. Antidiarrhoeal drugs used by the students are shown in Table 2. The most common drug used by the medical students was oral rehydration salt (ORS) in 38.39% followed by antibiotics in 27.78% students. The least commonly used drug was Loperamide (1.34%). Fig. 3 shows that 41.07% students have used these self medications once, 13.84% used twice in last 6 months while 37.5% were not sure about this. Regarding the cause of diarrhea as shown in Table 3, about ¾ (74.55%) students accepted that diarrhea was food associated. Only 6.25% accepted that it was drug induced. 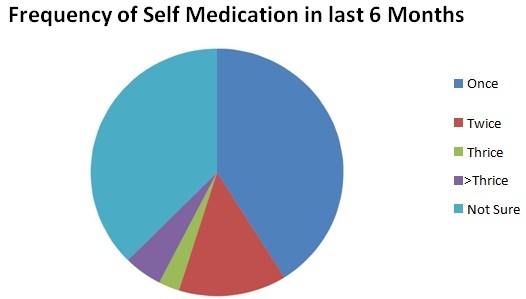 55.8% of them had the idea that self medication is sometimes harmful while 41.07% of them were against the practice of self medication, so one should avoid it as shown in Fig. 4. DISCUSSION: Self medication is consumption of drugs to cure a disease without consultation of a registered medical practitioner or repeated use of same drugs for repeated attack of similar symptoms 19. Since OTC drugs are easily available drugs, so self medication of these drugs is very common among the population. It can be potentially hazardous to the human beings due to incorrect self diagnosis, delay in seeking medical advice when needed, infrequent but serious adverse reactions, dangerous drug interactions, incorrect manner of administration, incorrect dosage, incorrect choice of therapy, masking of severe disease and risk of dependence and abuse 17. In our study 83.27% students have used self medication for diarrhea, out of which 81.48% were male and 85.07% were female. Our finding is similar to the study done in Dhule Medical College 20. Whereas this data is a little higher than found in coastal south Indian study 21 and somewhat lower than study done by Patil SB in Bhopal 6. Regarding the source of information, the most common source of information about OTC antidiarrheal drugs was books, followed by advice from seniors/parents and then internet and drug advertisement. Old prescriptions were the least used drug information source for RIMS medical students. In Tamil Nadu internet is the most common source of information 17. In Srikanth et al., study the most common source of information was from previous prescriptions (54%) 22. It varies from place to place. Most students used self medication due to mild nature of illness. Our finding is very similar to the finding of Sawhrey et al., study 23. In one of the north Indian study 90.4% used self medication due to quick relief and 88.6% for the trivial condition 5. In Dhule Medical College, 42% students used self medication as the time saving procedure 20 as compared to 8.03% in RIMS, Ranchi. Regarding frequency of self medication 41% students accepted use of antidiarrheal self medication only once in last 6 months whereas this figure in very high in Palestinian study 24. In our study 37.5% students were not sure about their self medication frequency whereas 13.84% had used this twice in last 6 months. In about ¾ students, onset of diarrhea was food associated. Food poisoning is a very common problem especially in students living in hostels. This is due to poor hygiene. 79% of cases of acute diarrhea are acquired by faeco-oral transmission or more commonly via ingestion from human or animal faeces 25. Different OTC antidiarrhoeal drugs are available in medicine shops. Majority of students used ORS as the self medication. Many patients with sudden onset of diarrhea have a benign and self limited illness requiring no treatment or evaluation. In severe cases, dehydration and electrolyte imbalances are the principle risks, particularly in infants, children and frail elderly patients. Oral rehydration therapy is therefore a cornerstone for patients with acute illness resulting in significant diarrhea. This is of particular importance in developing countries, where the use of ORS therapy saves many thousands of lives every year 26. Second next common drug group used was antibiotic. Only 1% here used Loperamide as antidiarrhoeal. Because of effectiveness and safety, Loperamide is marketed as over the counter distribution and is available in capsule, solution and chewable tablet forms. It acts quickly after an oral dose with peak plasma levels achieved within 3-5 h 26. Maximum no. of students was of the view that self medication is sometimes harmful while about 41% were against the use of self medication. Second year students know about drugs, its importance as well as adverse effects. 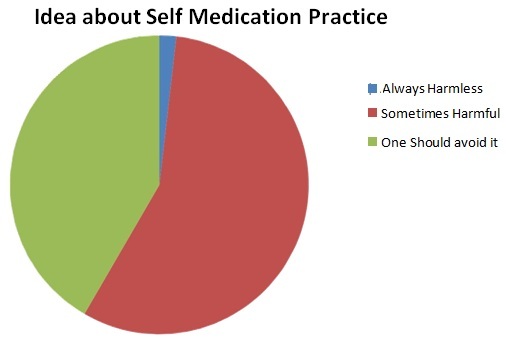 So only 3% of them believe that self medication is always harmless. In one of the North Indian study 51.2% were of the view that self medication is harmless 5, whereas in another study 48% of medical students supported self medication and 34% were against its use 27. CONCLUSION: Our result shows that self medication is very common in medical students especially in acute diarrhea. These drugs are easily available in medicine shops as OTC drugs. They mostly use ORS, antibiotics or probiotics. But Irregular use of antibiotics causes development of drug resistance which is increasing worldwide because self medication is a global phenomenon. Self medication practice would be safe if the people who use it have sufficient knowledge. Medical Students have insufficient knowledge about drugs and disease process, so they need to be educated about long term adverse effects of the drugs by its irrational use and also there is a need for review of educational programmes so that rational use of medicines should be promoted. ACKNOWLEDGEMENT: The authors are thankful to second year undergraduate medical students, RIMS, Ranchi, Jharkhand, India for their co-operation and to Head of Department, Pharmacology, RIMS, Ranchi for her constant support to carry out this work successfully. CONFLICT OF INTEREST: Authors declare no conflicts of interest. Ravichandran A and Basavareddy A: Perception of pharmacists regarding over-the-counter medication: A survey. Indian J Pharmacol 2016; 48: 729-32. Hughes C: Monitoring self-medication. Expert Opin Drug Saf 2003; 2(1): 1-5. Ruiz ME: Risks of self-medication practices. Curr Drug Saf 2010; 5(4): 315-23. Alam N, Saffoon N and Uddin R: Self-medication among medical and pharmacy students in Bangladesh. BMC Res Notes 2015; 8: 763. doi: 10.1186/s13104-015-1737-0. Gupta S and Singh M: Self-medication among North Indian first-year undergraduate healthcare students: A questionnaire-based study. Trop J Med Res 2016; 19(2): 162-7. Patil SB, Vardhamane S, Patil B, Santoshkumar J, Binjawadgi AS and Kanaki AR: Self-medication practice and perceptions among undergraduate medical students: A cross-sectional study. J Clin Diagn Res 2014; 8(12): HC20-3. Barr W and Smith A: Acute diarrhea in adults. Am Fam Physician. 2014; 89(3): 180-9. Kasellkar AA and Gupta M: Self Medication Practices among Medical students of a Private Institute. Indian J Pharm Sci 2015; 77(2): 178-82. Nalini GK: Self-Medication among Allopathic medical Doctors in Karnataka, India. British Journal of Medical Practionars 2010; 3(2): 325. Selvaraj K, Kumar SG and Ramalingam A: Prevalence of self-medication practices and its associated factors in Urban Puducherry, India. Perspect Clin Res 2014; 5(1): 32-6. Niknam R, Mousavi S, Safarpour A Mahmoudi L and Mahmoudi P: Self-medication of irritable bowel syndrome and dyspepsia: How appropriate is it? J Res Pharm Pract 2016; 5(2): 121-5. Kumar R, Goyal A, Podhy BM and Gupta YK: Self medication practice and factors influencing it among Medical and Paramedical students in India- a two period comparative cross sectional study. J National Sc Biol Med 2016; 7(2): 143-8. Albasheer OB, Mahfouz MS and Masmali BM: Self medication practice among undergraduate medical students of a Saudi Tertian Institution. Trop J Pharm Res 2016; 15(10); 2253-9. Aripkho G, Eja M and Enyi-Idoh K: Self medication in rural Africa: The Nigerian Experience. The Int J Health 2009; 11(1): 1-7. Montgomery AJ, Bradley C, Rochfort A and Panago-poulou E: A review of self-medication in physicians and medical students. Occup Med (London) 2011; 61(7): 490-497. Mehta RK and Sharma S: Knowledge attitude and practice of self-medication among medical students. IOSR Journal of Nursing and Health Sciences 2015; 4(1): 89-96. James J, Geethu C, Dan AN and Supriya A: Prevalence of over the counter medication practice in Pharmacy students- An observational study. 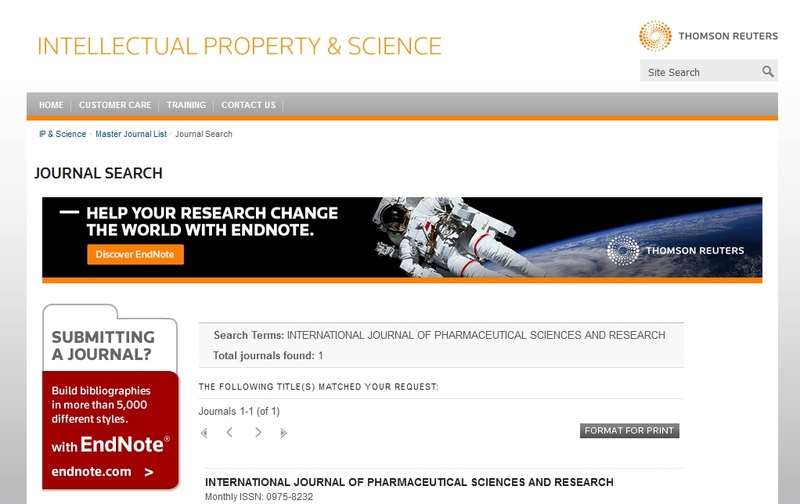 Int J Universal Pharmacy and Biosciences 2016; 5(4): 236-44. Keshri SS, Kesarwani P and Mishra M: Prevalence and pattern of self-medication practices in rural area of Barabanki. Indian J Clin Pract 2014; 25(7): 636-9. Dhir SK, Jain A, Batta M and Singh G: Patterns and practice of self medication among children presenting with acute respiratory tract infection or diarrhea. Int J Basic Clinpharmacol 2016; 5(1): 33-7. Patil SB: Self Medication: Awareness and attitude among undergraduate medical students in a Tertiary Care Medical College, Dhule. Ntl J of Comm Med 2015; 6(2): 198-202. Kumar N, Kanchan T, Unnikrishnan B, Rekha T, Mithra P and Kulkarni V: Perceptions and practices of self-medication among medical students in Coastal South India. 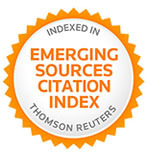 PLoS ONE 2013; 8(8): e72247. Srikanth, Priyadarshini MD, Banti B and Shireen R: Evaluation of self medication pattern among under graduate students in south India. J of Scientific and Innovative Research 2013; 2(2):2 44-50. Sawhney V, Bhat MY and Singh Z: A desciptive study of Prevalence, pattern and attitude of self medication among second professional medical students in a tertiary care centre. Int J Basic Clin Pharmacol 2015; 4(3): 542-6. Sawalha AF: A descriptive study of self-medication practices among Palestinian medical and nonmedical university students. Res Soc Adm Phar 2008; 4(2): 164-72. Camilleri M and Murray JA: Diarrhea and constipation .in: Harrison’s Principles of Internal Medicine. Mc Graw Hill Education; Edition 19th, 2015: 264-73. Sharkey KA and Wallace JL: Treatment of disorders of bowel motility and water flux; anti-emetics; agents used in biliary and pancreatic disease. In: Goodman & Gilman’s The Pharmacological Basis of Therapeutics. Mc Graw Hill Medical, New York, Edition 12th, 2011: 1323-50. Sujatha P, Sireesha N and Annapurna D: Study on usage of self-medication in MBBS students in a teaching hospital. IOSR Jr Dent Med Sci 2015; 14(2): 28-35. Kumari K, Toppo MS and Kumar M: The practice of self medication in diarrhea among second year medical students in a tertiary care hospital in Jharkhand. Int J Pharm Sci & Res 2018; 9(11): 4941-45. doi: 10.13040/IJPSR.0975-8232.9(11).4941-45. Authors Address: Department of Pharmacology, Rajendra Institute of Medical Sciences, Ranchi, Jharkhand, India.